Fall is just around the corner now, and here I am, having a fever and sneezing all day long. Anyone else already down with the seasonal cold? Actually, I call it the after-vacation cold. Oh yes, we’ve been away a while, enjoying our holidays in the lovely and very hot Greece! We had a break from the computer, from cooking and working, we swam a lot, ate delicious Greek food, and just took it easy. But, the holidays are now over and we’re fully back and working again! BTW, if you would like to see a post about our Greek holidays, the places we visited and the food we ate, let us know below in the comments (or on social media) and we’ll gladly share our pictures with you! So, while we’re back we are already saying goodbye to the last of the summer fruit, and oh my, we are going to miss it come fall and winter. And if you, like me, are afraid to make a vegan panna cotta, fear not! 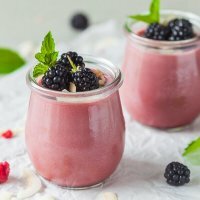 This Blackberry Coconut Vegan Panna Cotta is ridiculously easy to make, and it only takes a couple of ingredients and like 10 minutes of cooking. Could it be any easier? 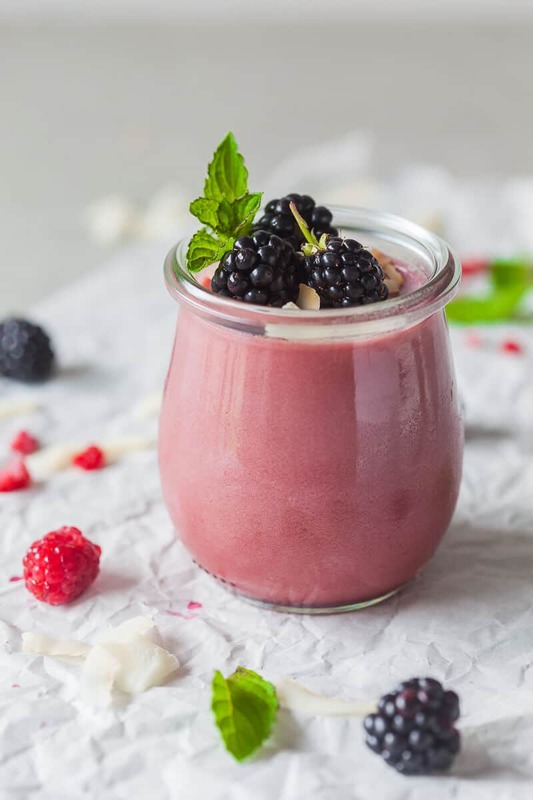 Just mash some blackberries, strain to remove seeds, add coconut milk, lemon, sugar and agar agar, cook a couple of minutes, transfer to jars and let it cool down. That’s basically it! 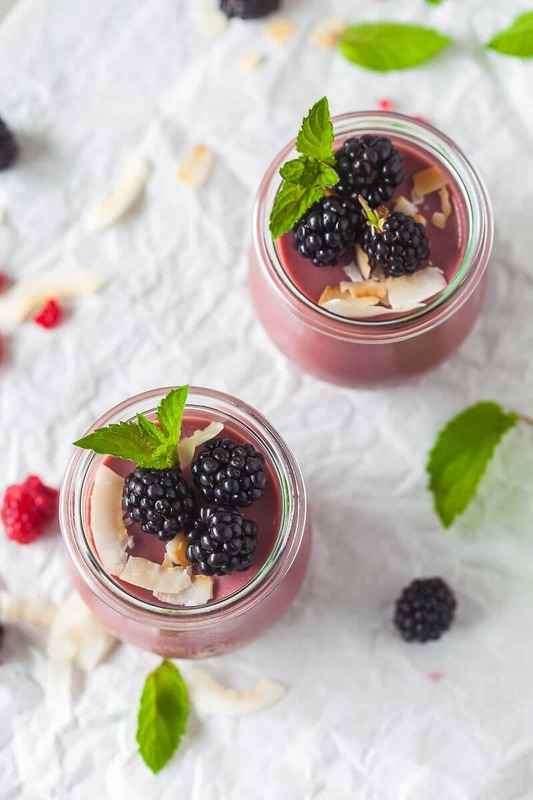 This Blackberry Coconut Vegan Panna Cotta is a refreshing summer dessert made with blackberries and coconut milk. With a fork or in a blender, mash blackberries to a pulp. Strain the pulp through a strainer to remove seeds. 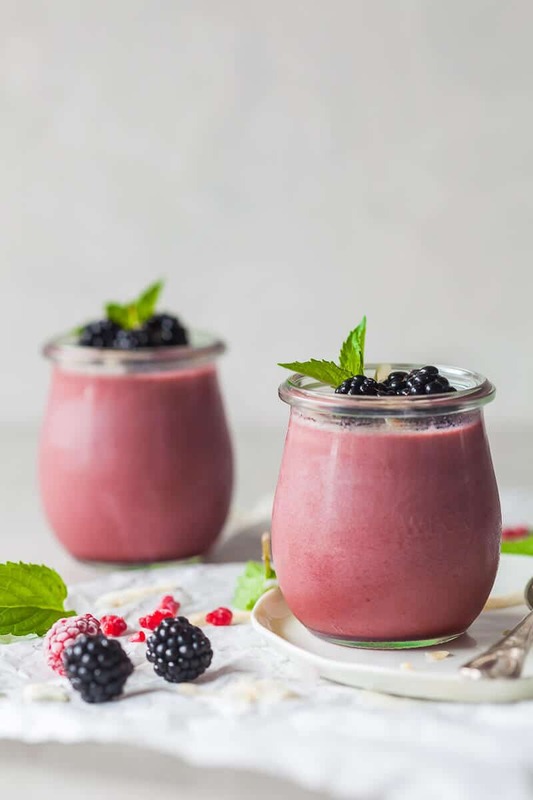 Pour the blackberry pulp into a small pot, add coconut milk, lemon juice, regular sugar and coconut sugar, and agar agar. Whisk to combine, then bring the mixture to a boil, and on medium let simmer for about 2 minutes, stirring occasionally. When the agar agar has melted, remove from stove, let it cool for a minute or two, then pour the mixture into small durable glasses. Leave on the counter to cool completely. At the beginning of the cooling process you may need to stir the mixture occasionally to fully combine it, or the coconut milk will likely separate. You only need to do this every couple of minutes or so until the liquids start to solidify. After that, don't stir it any more, but just let it rest and cool down. Once cooled, cover the jars with a lid and transfer to fridge to continue cooling and firming, for at least 2 hours, or ideally, overnight. 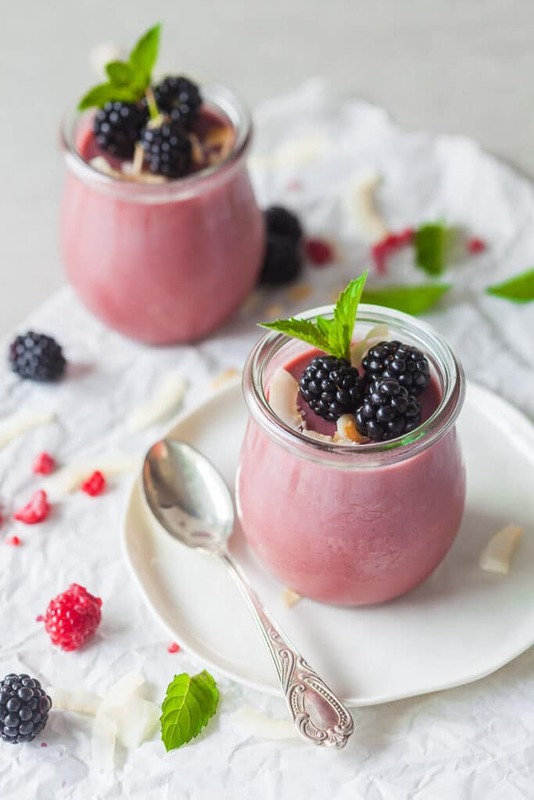 When ready to serve, remove the vegan panna cotta from the fridge, remove the lids, decorate with fresh berries or berry sauce and add a sprinkle of toasted coconut flakes.